To those who have grabbed the Stackable theme by subscribing to our newsletter, you can re-download the theme through the link you got in your previous email. We’ll be sending you a new email with the download link. Don’t Have The Stackable Theme Yet? 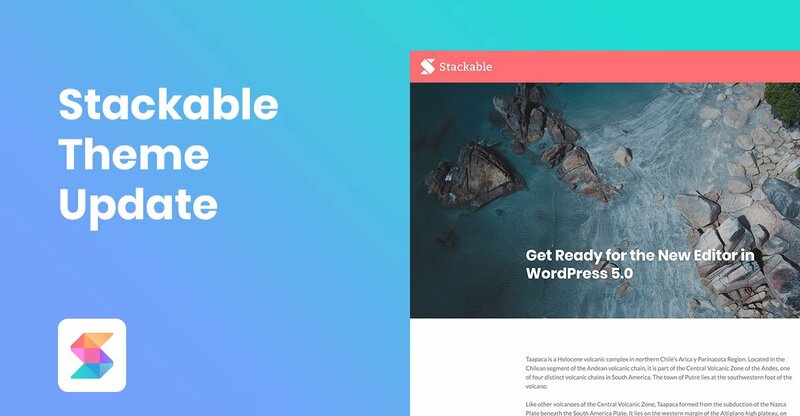 It’s free, it’s Gutenberg-ready, it’s responsive and it’s built specifically for WordPress 5.0 and Stackable Blocks. It’s the theme we’re using in our very own site. Grab it by subscribing to our newsletter. I love your theme and block. Everything is working great. Just two comments about responsiveness. (2) Movie: The .mov movie in “Cover” block works well on MacBook, but is replaced by a fixed image on iPhone. (1) Sticky menu is really disabled for mobile devices so as not to occupy a lot of space.